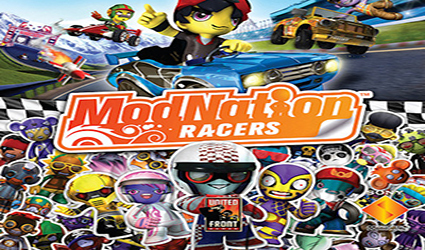 “Play, Create, Share” was Sony’s motto when LittleBigPlanet was released, and they echo this sentiment with Modnation Racers. 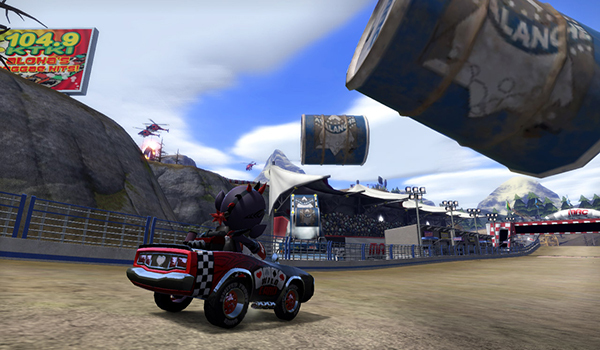 It’s not every day you get to fiddle with a powerful editor for a console title, but is that all Modnation Racers does well, or is there a bigger picture to paint? 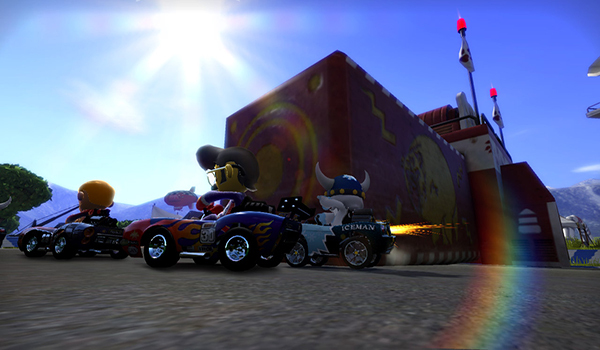 Modnation Racers, like Blur (also released on the 25th), is cut from the same cloth as Mario Kart, or other classic kart racers, and United Front embraces its inspirations fully. This can be seen at every turn. The look of the game is vivid, expressive, and cartoony – a style which may not be for everyone – and does its best never to depart from that light-heartedness. The graphics can look a bit choppy and awkward when it comes to numbers on cars or mouths moving, and there are a few occasions where frame rates dip, but never nosedive. Single player hosts, Biff and Gary, comprise most of the game’s humor, and they really bring out not just the comedy, but personify the light-hearted fun of the game. It’s a rare treat to be able to laugh on a consistent basis at a game, with the exception of games that are so terrible that it becomes comical. When Biff and Gary aren’t involved, the cut scenes are mostly hit or miss. When you start up the game, you are immediately brought into an online lobby called the ModSpot which is a bridge to every other section of the game, or you can just sit around and chat it up with other folks, and other players do tend to be much more chatty in Modnation than most PS3 titles. The community emphasis of this game is as heavily emphasized as the customization itself. From the ModSpot, top player created racers, randomized mods, and randomized tracks are constantly being displayed for everyone to see. I was skeptical about the extent to which the editor could go with a limited number of art assets, until I found that you can essentially create your own assets to an extent. This opens up an infinite avenue of possibilities, and I’ve already seen dozens of custom and replicated creations. From racers perfectly resembling Bender, Mr. T, and Iron Man, to kart remakes of the General Lee and the Mystery Machine, and tracks that replicate DE_Dust2, recreating virtually anything is possible, and of course the potential for fresh content is just as limitless. If United Front has set out to prove that every single detail is completely malleable, they have succeeded ten times over. A great deal of the beauty of the game’s editor lies in the ease of use. It is far more powerful than LittleBigPlanet’s, and more intuitive to boot. The depths of the editor may still require a lot of learning to fully grasp, but from the very get-go players will find themselves capable of creating some very cool things. It seems a little odd to say, but one of my early complaints was that I had to tear myself from the editor to play the campaign – not because I was ready to at that time, but because I needed to do so in order to unlock significant number of items for the editor. The campaign is short and sweet along with being varied and fun, but be warned that the difficulty spikes up dramatically very early on and cannot be adjusted, making for a potentially frustratingly challenging experience. I didn’t feel as though the campaign was awful, but it felt more as though playing it was a necessity rather than a choice. Of course, a few items are available for microtransactions (1-2 bucks) in the shop. Alternatively, you can use tokens, also from the campaign, to gamble on new items. Before I start on the gameplay, I’ll blunt, the loading times are neither normal nor acceptable for a game in this day and age. That said, they are more of an irritant than a detriment, but you should be aware that loading new tracks can take 30-45 seconds, up to a minute or more in rare cases. Embrace the arcade. This is, through and through, how United Fronts approaches the driving. Controls are very loose, and can be tweaked slightly from the ModSpot, and there is a dedicated drift button for racking up points and taking sharp turns. Points can be used to shield against offensive power-ups, or for a nitro like boost. Additionally, you gain points by doing aerial spins and drafting behind other racers. Shielding takes pitch-perfect timing using audio and visual cues which vary based upon which power-up you have to block, and it doesn’t leave you feeling helpless since you never have to rely on outside elements in order to build up your meter. On the surface, there aren’t many power-ups; only four. However, each one can be stacked up to level 3. Each additional level causes a power-up to do essentially the same thing as before, but bigger and better. Levels 1 and 2 of the Boost pick up, for example, both give you a burst of speed when used, whereas level 3 can actually warp you ahead on the track. On top of power-ups, and building your boost/shield meter, there are a number of subtleties that make the gameplay even deeper and more compelling, such as side swiping, devastators, etc. The difference between karts is purely aesthetic, so you won’t be forced to choose a car you like less than another just because one accelerates 2% faster. 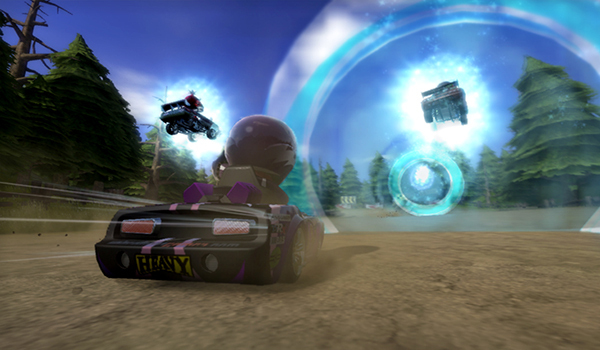 The multiplayer supports both online play and local split-screen, and is where the spectacular variation allowed by the game’s editor shines through, as you’ll likely spend an incredible amount of time racing on custom tracks, whether they’re made by you, your friends, or strangers. After completing the campaign, and spending a lot of time in custom tracks, the editor, and multiplayer, I gained about 30% of the game’s trophies. Even if you’re not an achievement junkie, that should signify that there is a lot to do to keep the breath of life in the game. With the customization and community element, the sheer breadth of potential new content, the replay value of Modnation approaches infinity. Alright, maybe not infinity, but you get my point. Charming and delightful is how Modnation Racers is best described. It is light hearted fun, but with enough technical depth to be both challenging and satisfying to master. While the game may have some noticeable load time issues, a patch is in the works. That may not make it acceptable, but the load times aren’t game breaking, and if that is the worst of the game’s problems, then it isn’t in half-bad shape.